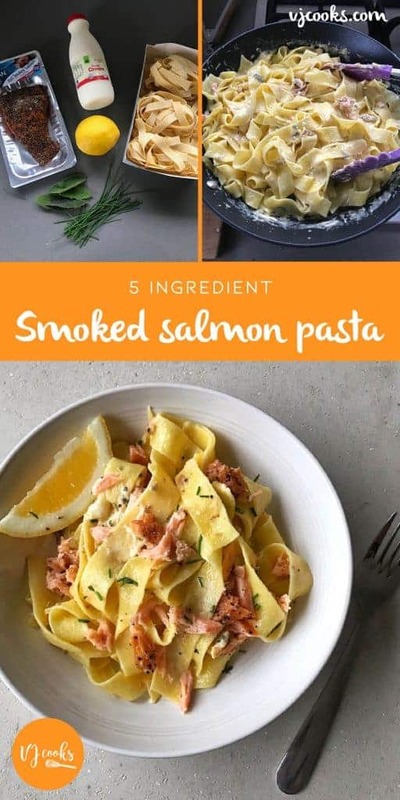 This hot smoked salmon pasta has a lovely creamy lemon flavour, you only need a few ingredients to create this easy and super fast recipe. 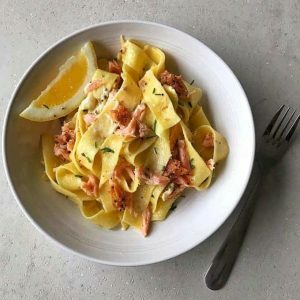 This hot smoked salmon pasta takes less than 20 minutes to make. 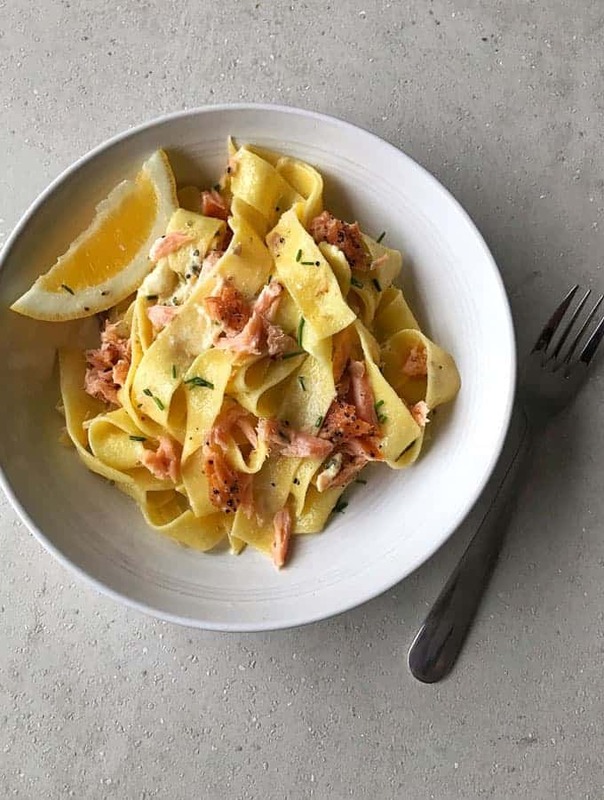 The fresh lemon mixed with cream, salmon and al dente pappardelle makes for one amazing dinner. I have been making this easy pasta for years now, it was inspired by a recipe from Julie Biuso when I worked as a junior graphic designer at Taste magazine back in 2005. I love having hot smoked salmon in my fridge to use in pasta, wraps or on a bagel with cream cheese. To make the delicious sauce for this recipe you fry sage leaves in butter, add cream and lemon then stir until it becomes thick and bubbling. I like to flake half of the salmon into the sauce and reserve the other half to use at the end of the dish. 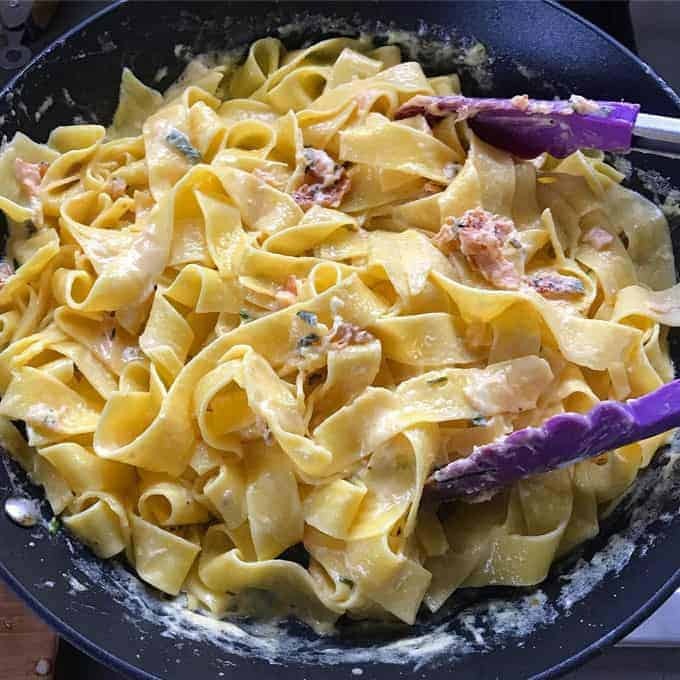 This way it doesn’t get broken up too much and you can have nice little pieces of salmon on top of the creamy pappardelle. 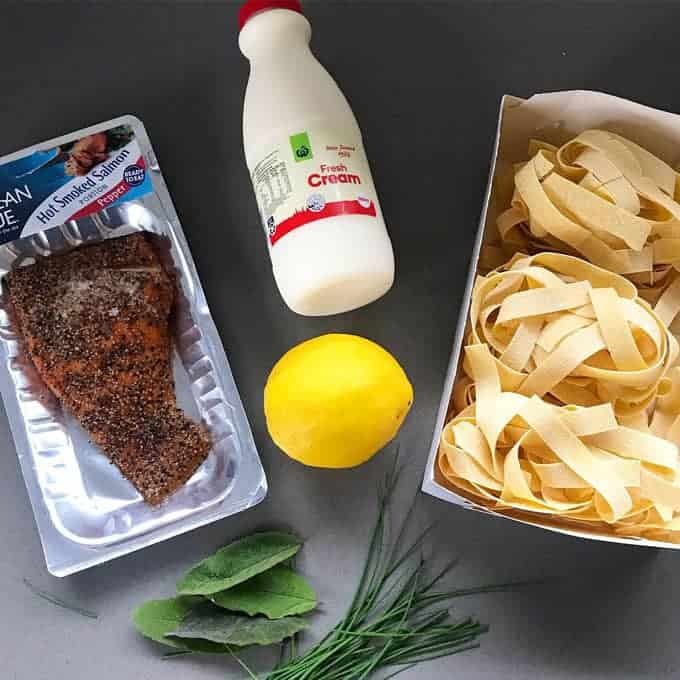 I used dried pappardelle in this recipe but most dried or fresh pasta would work, just cook according to the packet instructions until al dente. Make sure you season the creamy sauce to taste with salt and black pepper before adding the cooked pasta. 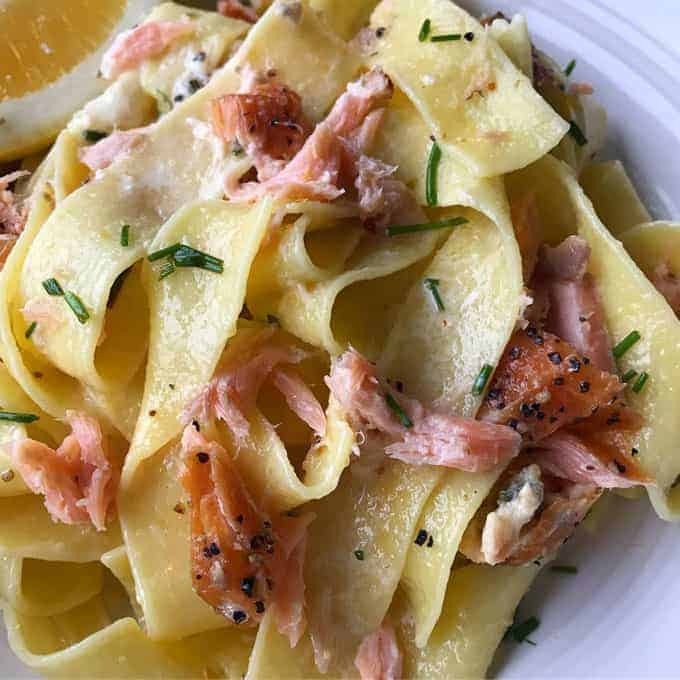 I like to serve my smoked salmon pasta garnished with chopped chives and a wedge of lemon. Remove the skin of the lemon and cut out the segments leaving the white pith, squeeze the rest of the juice out of the lemon and reserve then cut the lemon segments in half. Brown butter in a large frypan on medium heat, add sage leaves. Add cream to the frypan and cook until bubbling. Stir in the lemon segments and juice, cook for a few minutes until it thickens up a bit. 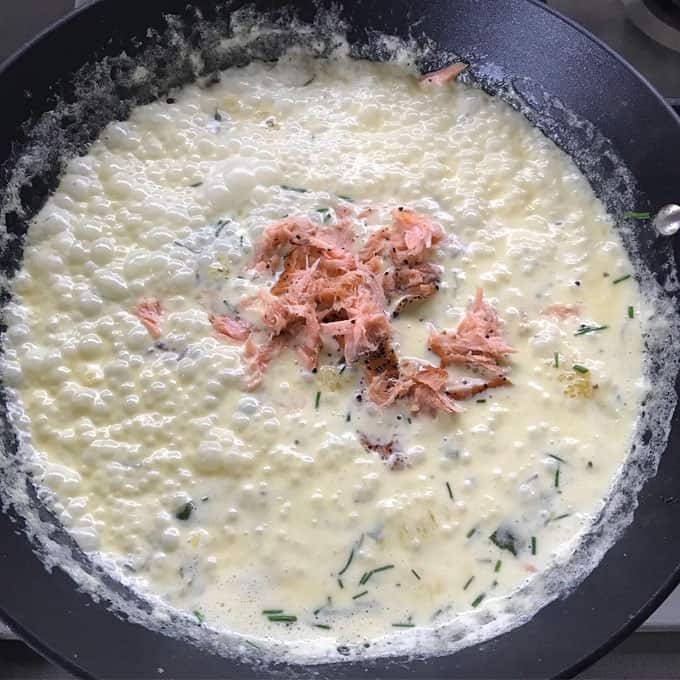 Flake half of the smoked salmon into the cream and stir to combine. Check the sauce and season to taste with salt and black pepper. Add the cooked pasta to the hot creamy sauce and scatter over finely chopped chives. Serve in bowls with the rest of the salmon flaked into each portion.